We believe for two reasons. Because we believe it is true and because it gives us hope. We believe that Jesus, the Son of God, came down from heaven and became human just like us. We believe that Jesus sacrificed His life on a cross to pay the penalty for the sin of the entire world. We also believe that Jesus supernaturally rose from dead proving to be the Son of God and proving that everything He said is true. And we believe in the resurrection promise, that “God has not only raised up Jesus, He will also raise us up from the dead by His power” (1 Corinthians 6:14). That’s what we believe, and that is our hope. But wait a minute. Dead people don’t come back to life. That’s impossible. It would take a miracle for someone to come back to life from the dead. Yes, it would. And that’s exactly what Christianity is founded on, the miracle of the resurrection of Jesus Christ. Apart from a miracle, there is no resurrection and there is no Gospel. The Bible admits that. “If there is no resurrection of the dead,” if resurrection is impossible, “not even Christ has been raised, and if Christ has not been raised, then our preaching is vain, and so is our faith” (1 Corinthians 15:13-14). But if God is real, then surely miracles are possible. If God created the universe with a word, then surely He can raise the dead. But the topic of resurrection is so theological – and scientifically impossible – and seems so irrelevant to life today. Sure, if there’s a heaven, we want to go there when we die. But if you’re in your 20s, or 30s, or 40s, you’ve got a lot of life left and don’t want to think about death, not yet. But there’s a reality every person must accept. You don’t know how many days you have left. 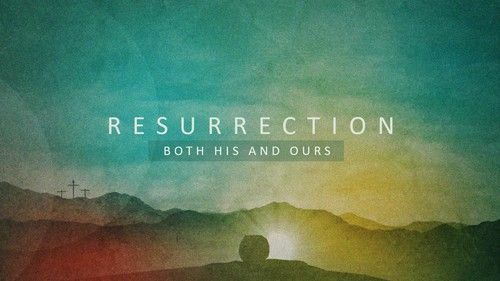 And, resurrection is not just an after-death promise; it’s a promise that shapes our present reality. The promise tells us how much we are loved by our Father, and that we can be secure in His promise and certain of our hope. We can live today with joy and peace. And we can live with a resurrection perspective that shapes how we walk through life and how we walk toward death. And why? Because of the promise. “God has not only raised up Jesus, He will also raise us up from the dead by His power” (1 Corinthians 6:14). And because we believe, we have hope.